Hope's Cafe: Zevia Natural Soda-Review and Giveaway! "Stevia is an herb in the sunflower family, native to subtropical and tropical South America and Central America. For centuries, the Guarani Native Americans of Paraguay and Brazil used stevia as a sweetener in native foods and medicinal teas. The extract from the stevia leaf has no calories, no effect on blood sugar levels, and is hundreds of times sweeter than sugar. Some stevia extracts may have a bitter after taste at high concentrations. Zevia® Natural Diet Soda is formulated with erythritol, a natural sugar alcohol which counteracts this effect. Zevia LLC has a patent pending on its unique and delicious flavor formula. In 2006 and 2008 the World Health Organization evaluated numerous stevia studies and concluded that stevia is safe. Among other things, the World Health Organization presented evidence of beneficial effects on hypertension and diabetes. Click Here for the WHO Research." 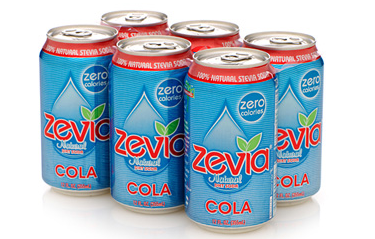 Zevia soda comes in 7 different flavors-Cola, Ginger Root Beer, Twist, Ginger Ale, Black Cherry, Orange, and Dr. Zevia. I let my Dad try the cola, since he is the big coke drinker in our house. He said there was a small flavor difference...basically you could tell it was a "diet" drink (no, he doesn't drink diet sodas at all, he's hooked on regular coke!). I actually liked the orange flavor best. It tasted like normal orange soda, and had a very refreshing flavor. The Dr. Zevia is of course like Dr. Pepper, and the Twist is a lemon-lime flavor. "ZEVIA, pronounced zē-vē-ah, was the first and remains the best tasting 100% natural, zero calorie soda. With only the purest ingredients, ZEVIA contains none of the chemically processed artificial sugar substitutes, artificial colors, flavors or preservatives found in other diet sodas. ZEVIA is 100% natural, has zero calories, zero net carbs, zero fat, and little or no sodium (depending on flavor)." Zevia is giving a 6-pack variety of Soda to one of my readers! 2 entries-"Like" Zevia on Facebook; tell them which flavor you'd like to try (or a flavor you'd like them to make! ), and that you came from Hope's Cafe! This giveaway ends Tuesday, January 4, 2011, at 11:59 p.m. Please leave a valid email address in each comment, as this is how the winner will be notified. Winner will have 48 hours to respond, or another winner will be chosen. Giveaway open to US residents only. Disclaimer:I was not monetarily compensated in any way for this post. All thoughts and opinions are mine. All quotes taken from the Zevia website. The closest is Fresh Market in Winston Salem, about 10 miles away. The closest location to me is Durham Kroger 21.34 miles away. There are not locations near me. I would have to buy online. The closest location to me is Super King Cash 1.61 miles away from me. The closest location is Chamberlins Market in Kissimmee, FL. It is carried at Woodman's store by me. I used the store locator on the website and it said there were no results found. I entered the phitgrip giveaway. I entered the vitamin water giveaway.